Today I have a great interview with Eric Shanfelt from LocalSearchHandbook.com. He has put together a new local seo handbook for small business. I got a chance to review the text and put in my two cents. It is a very well done book and quite affordable. So if you are looking for local seo help, I recommend this book. Q.Thanks for taking the time today Eric, can you tell us a little about yourself? A. I’ve been working in online media since 1994 when I led the launch of the online part of Windows NT Magazine (now Windows IT Pro) which grew to a multi-million dollar business. Since then, I have served at various consumer and business-to-business media companies in both executive and consulting roles. As part of my career, I’ve had to become intimately familiar with web, email, social media, SEO, online advertising, analytics, lead generation and more. I still work in online publishing as Senior VP of eMedia for Thomas Nelson, but local SEO has become a personal passion of mine for the past several years. On the personal side, I’m the husband of an amazing wife, father of two beautiful girls under the age of four, a private pilot / aviation enthusiast, musician, and adoption / orphan care advocate. A. Working in publishing, many of our magazines’ readers and distribution partners were local businesses (self-storage, welding, natural product retailing, restaurants, hotels, tanning salons, yarn / quilt shops, etc.). Every time I talked with them, they wanted to know how they could better market their business online. I wrote articles in our magazine and spoke at our conferences to local business owners about online marketing and it became clear that local SEO was the biggest need they had … and the biggest mystery to them. I see a big gap missing in the information for local business owners. There is a lot of great, free information on the web around local search, but much of it is written in language designed for SEO consultants, not business owners. It’s also scattered on various sites and not organized all in one place. And, of course, there is a lot of misinformation out there as well that could actually hurt a local business owner if they didn’t know it. I also see most business owners focusing exclusively on Google Places. They feel all they need to do is claim their listing and everything is fine. Of course, that’s not true … there is so much more. I wrote this book to be a plain-English guide to local business owners that will educate them on the fundamentals of local search optimization … both Google Places and beyond. Q. Who should purchase this book? A. I truly believe that every owner / operator of a local business should buy this book. It doesn’t matter what geographic market or industry you’re in or whether you have one location, several locations, or a national chain. The information in this book is applicable to any business marketing to local geographic regions. BTW, this book is an excellent resource even if a business owner plans to hire or is currently working with a local search consultant. It will help educate the owner on the fundamentals of local search and know how to better research and work with a local search consultant. Q. Where can you get the book? A. You can buy the book in PDF format directly from my web site, LocalSearchHandbook.com. In the next month or so, you’ll also be able to buy a print or Kindle version of the book directly from Amazon. Q. Are are the future plans for the book/updates? A. Absolutely. As you know, the local search landscape changes continually. I plan on releasing updates to the PDF version every six months or so. Anyone who purchases the PDF version through my web site will get free lifetime updates every time a new version is released. Unfortunately, because of the costs involved with print / Kindle, I can only update that version every 12-18 months and cannot offer free lifetime updates. Q. Why is local search important for small business? A. First, I want to clarify that this book is written for local businesses, not necessarily small businesses. There are some small businesses that are trying to market nationally and local search is not appropriate for them. There are also some very large businesses with hundreds of local locations … local search is totally appropriate for them. Of course, there are a lot of small businesses who also focus on a local region and local search is what they should focus on. To those owner / operators of local businesses, I would say that there are people online right now looking for a business like yours in your area. They’re using computers, mobile phone and GPS devices and they’re using Google, Bing, Yahoo, Facebook, or hundreds of other sites and services. Will these potential customers find you? According to a BrightLocal survey done about a year ago, over 80% of U.S consumers use the Internet to find a local business, but only 41% of local searches are done on Google Places. 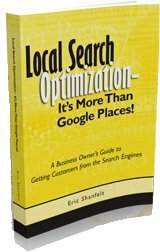 That’s why local search optimization is so critical for local businesses and it’s why I wrote this book. Q. Where do you see local search marketing going in the near future? A. One thing’s for sure, local search is only going to get bigger … and it’s going to expand in all different directions. Enabling local search for mobile devices is already getting big and will be an even bigger focus on 2012 (like Siri on the iPhone). Local search will also see greater emphasis in social media outlets like Facebook, Google+ and Twitter. There will continue to be changes to Google Places, Bing Local, and all of the internet yellow pages, review sites and online directories. And there will be more and more web sites and services that integrate local search. New services will also be developed or expanded to help business owners manage local search. However, I truly believe that while there will be specific tactical adjustments that business owners will need to make, the fundamental strategies behind local search that I address in this book will continue to be the same. 1) I have a free blog / email newsletter on my site, LocalSearchHandbook.com My goal is not to break every big story or talk about everything that a search engine consultant would want to know about. There are some amazing people out there like you, Mike Blumenthal, Linda Buquet, and David Mihm who already do that. Instead, I focus on the major changes that a business owner should know about, try to explain it in plain English, and always end the post with a “Bottom Line – What You Should Do About It” that tells the business owner what action they need to take if any. 2) If you’re a local search consultant and would like a free complimentary copy of my book, please contact me via my web site. I’ll be glad to send you one. I’ll also be launching an affiliate program so that if you want to refer your clients to buy the book, you’ll get a nice commission. 3) If you see anything in the book that you’d like me to expand upon in the next edition … or that you think should be covered differently … please let me know! Thanks for giving me the opportunity to do this interview, Larry! Thanks for putting this Local SEO book together, Larry. You are correct; too many local business owners tend to stop with Google Places when they do their own SEO. But the good news is many more business owners know what SEO is and they see local SEO services as a value-added place to invest their marketing dollars. The key is educating them about all the diverse options available, and how quickly the local SEO “formulas” continue to change as the online marketplace evolves. Do you have plans to update your book on an ongoing basis? Would like to review a copy and also get feedback from you on LocalSearchTool.org, along with our directory submission service at LocalSiteSubmit.com. Look forward to reading more on your “top stories” roundups. Thanks!